Latte Levy: What are businesses doing? Billions of disposable coffee cups are thrown away in the UK every year, with most ending up in landfill sites. Coffee shop owners are under mounting pressure to do more to stop that from happening. Companies are experimenting with their own strategies. Starbucks is trialling a 5p charge per cup in as many as 25 of its central London outlets. So what are other businesses doing? Starbucks is the only coffee chain charging customers for disposable cups at and that, for now, is for a trial period. High Street chain Eat says it's the only firm to sell 100% biodegradable cups in a bid to alleviate concerns about its environmental impact. McDonald's has installed recycling units in around 80% of its UK stores, though this requires customers to separate the cups from other waste packaging themselves. The most common tactic for cutting waste has been to offer customers discounts for bringing in their own reusable cups. Big firms like Costa Coffee and Pret a Manger give discounts of up to 50p. From next week, Greggs Bakery will offer 20p off hot drinks for customers who bring their own cups. However, some customers have complained on social media that they have seen baristas measuring drinks in disposable cups and then tipping the drink into a reusable vessel - negating the whole point of the exercise. 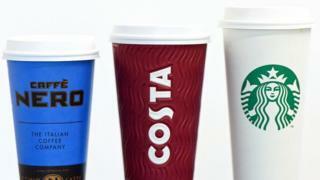 No major coffee chains apart from Starbucks have announced plans yet to charge customers for their disposable cups. A study by Cardiff University Professor Wouter Poortinga suggests that charging for cups may be a more effective way of changing consumer behaviour than discounts. In a series of trials at 12 coffee shops in Cardiff, the study found nearly a 20% increase in hot drinks sales with reusable cups if stores offer free reusable coffee cups and charged for disposable ones. But for now, most coffee chains are choosing discounts over charges - carrots over sticks.